I was busy with the World Magic Cup Qualifier last weekend (finished 4-4-1 for 83rd place out of 266), a 64 person PPTQ (0-2 drop after losing to 2 of the best players in Nagoya), and a 48 person Last Sun tournament qualifier (finished 3-3 for 17th out of 48) so I JUST finished looking at the Battle for Zendikar spoiler last night. Lots of people are saying this will be another good set for limited, but that there isn’t much for the constructed formats such as standard. I think many people are forgetting about what happened with Dragons of Tarkir. It was met with a lukewarm reception, and some people even canceled their pre-orders after seeing the whole set (myself included. I ended up doing 3 pre-releases and just buying singles I needed instead). The set ended up being pretty sweet with sleepers like Deathmist Raptor, Den Protector, and the Dragonlords (Atarka and Ojutai especially). I have a feeling we’ll see a lot of innovation with BFZ just as we did with DTK. How we play might be different though. With a slower metagame we’re venturing into uncharted territory. Wizards has put together some deep, complex metagames since Khans of Tarkir started, and I don’t think that will end any time soon. The limited environment is also looking different from the Khans of Tarkir block. 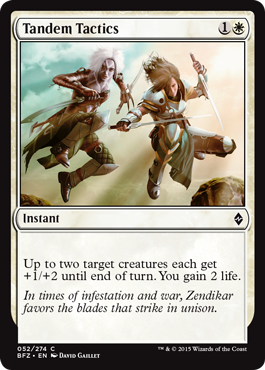 Today I’ll be talking about which white cards I think will be sought after in Battle for Zendikar limited. I’m starting today’s article with removal cards in white. Why? Because we are fighting Eldrazi here folks. It’s not safe enough to play 23 creatures with good synergy and hope to beat your opponent before they drop an Eldrazi and trample you. 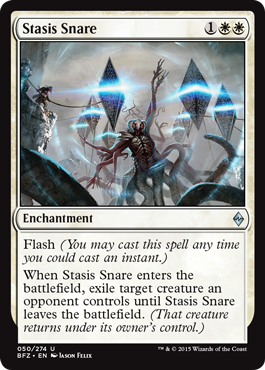 Stasis Snare is going to be one of the best removal cards in white for limited. It has flash, it hits any creature (not just blocking or attacking), and it’s relatively easy to cast. Its only draw back is that it’s an enchantment and can be destroyed. You should also note that BFZ plays heavily on using cards from Exile and putting them into the graveyard (called Processing). If you have an Eldrazi that can move exiled creatures to the graveyard, you could basically consider this a white Murder (M13). Good removal, but also has synergy. I like it. High draft pick. Not great against Ally decks in draft, but I think in sealed it will be pretty good. Players will have a lot of 4 power or greater creatures and this will be able to destroy half of your opponent’s creatures. A good choice for your limited deck. Four mana is a little high, but I doubt you’ll run into any 4 power creatures before turn 4 anyways. Sheer Drop is a much better card that Smite the Monstrous I think. 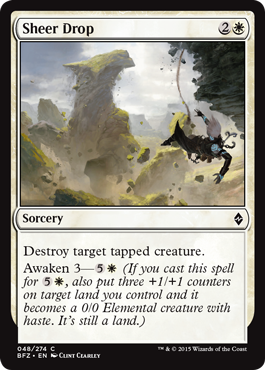 You’ll still have to chump block that Eldrazi before you can use it since it’s sorcery speed, but 3 mana isn’t bad for a kill effect in white, and you get the added bonus of making a 3/3 Elemental Land with haste if you pay 6 mana later in the game. Easily splashed in a 3 color deck if you can put one together. Not as good as Stasis Snare, but almost as good. It’s not as good as Divine Verdict (M15) which would destroy an attacking or blocking creature, but against a fast Allies deck with a lot of 3 and 4 toughness creatures it will be good to have. It won’t be killing any Eldrazi, but if you block and use this you might kill it. Decent removal in limited, but not as good as the other 3 I’ve talked about so far. This could be a good card to have in an Allies deck, especially if you’re attacking with first strike, trample, or any other beneficial effect. 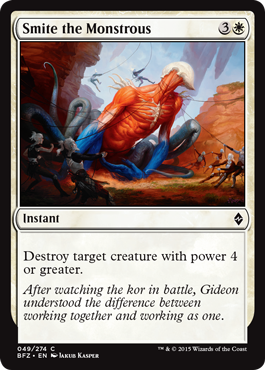 Five damage for five mana is so-so, but being in white and at instant speed makes it playable. If you’re playing a large number of 2,3, and 4 mana Allies and then clear out all of your opponents Eldrazi Scion or other difficult blockers you could do a lot of damage in one turn. While not great, I think you’ll want to play this if your opponent is playing a lot of Scions to ramp into something big. Speaking of Allies, there are quite a few in white, each with an interesting ability. 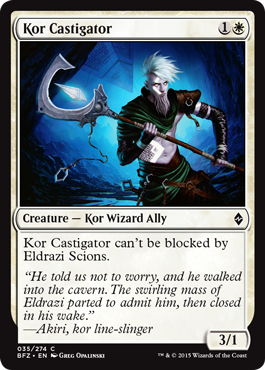 First off is a rather vanilla Kor Castigator (ouch). He’s basically a 3/1 beater that you can play early and he is great against Eldrazi heavy decks. If you’re able to pump him up with some combat tricks or throw a couple other good Allies into the mix, he can be formidable. Not a great card, but I think he’ll be a solid choice in white decks for the early game. As I was saying, if you play Castigator with other Allies he can be pretty good. 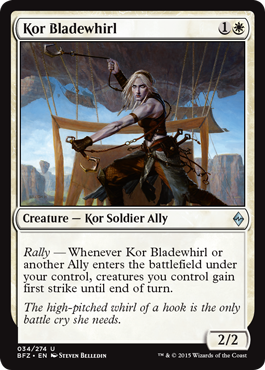 Kor Bladewhirl makes blocking early very unfavorable, especially if you’re facing off against other Ally decks. It might not be that great late game when they have a few Eldrazi and other beasts on board, but Bladewhirl can be good between turns 3-6. It would be an auto include in an Ally deck, but I think it would also be a good choice in other aggressive decks as a combat trick. Entanglers are a little bit higher on the curve but nonetheless a good choice in limited. You get a 3/4 creature for 5 that taps an opponents best creature when it enters the battlefield which is solid, but it can also be used again later on whenever you play another Ally. Strong card in draft, maybe a high pick if you’re going white/X allies, but not bad in sealed either if you are playing 3-4 Allies (which isn’t unrealistic). Lifegain is always important in limited, and nothing is better than getting a 4/4 flyer on top of that. Flyers seem like the best way to get damage in since the ground is going to be absolutely jam packed with Eldrazi, their scions, and allies. Even at 6 mana, I think I would find myself drafting Angel of Renewal rather early. The mana cost might seem high, but we’re talking about a set with cards that cost 10 or more. There will be ramp, and the Angel will be played early sometimes. Grab her in draft if you see her. Speaking of life gain, there are a number of cards in the set that have synergy with the ability, and Serene Steward is one of them. 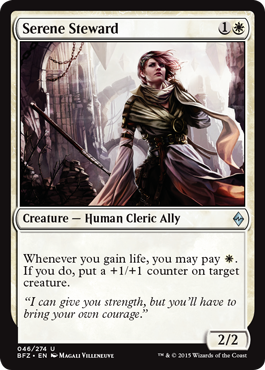 Steward is going to be a 2/2 bear most of the time, but if you are able to draft multiple lifelink cards or cards that gain you life, you can use her ability to pump up your threats. I don’t think I’d take her early in a draft, but I could definitely see her sneaking into that 22nd or 23rd card slot, especially if the synergy is there. 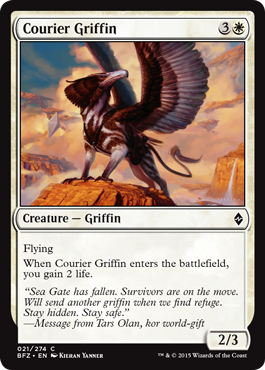 For example, Courier Griffin is a decent flyer for 4 mana, and the added life gain helps the Steward. If you are playing this alongside other lifelink creatures and have a card like Felidar Sovereign as one of your win conditions, it can be pretty good. Playing this on turn 5 with a Steward in play would let you get a 3/4 flyer for 5 mana which isn’t bad at all. The Griffin is a roleplayer, and will block small Eldrazi and other threats in the air or give you a little bit of evasion as well. Another solid choice in limited. 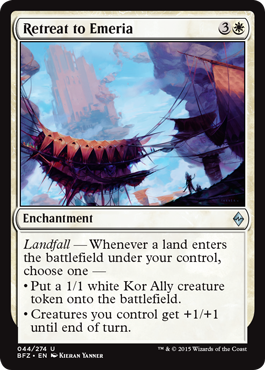 Limited is usually played with 17-18 land and that means that just about any creature you play with Landfall will have that ability triggered almost every turn. If you have a card like Evolving Wilds or some other card that puts a land into play like green does, you can activate the trigger more than once. 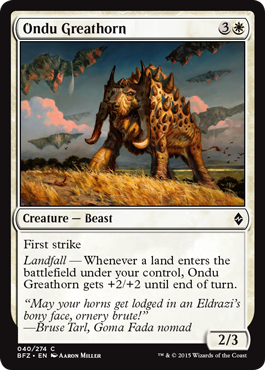 Ondu Greathorn is alright as a 2/3 first striker for 4 mana, but most of the time I think he’ll be a 4/5 first striker if you can drop a land often. The drawback to this is that he’ll be more offensive than defensive since you’ll only be able to activate it on your turn most of the time. A 4/5 for 4 mana still isn’t bad though, especially if you’re playing 18 land in order to cast your big Eldrazi on time. Good card to pick as your 22nd-23rd choice in your deck. Continuing the topic on Landfall, Retreat to Emeria and pretty much the ENTIRE Landfall enchantment cycle for each color is great. White is one of my favorite though. You’re going to get either a few creatures out of this or you’re going to be able to make an overwhelming attacking. This is a great card to have in an Ally deck near the top of your curve but it can fit in just about any other deck you want to build as well. It will be great in both sealed and draft. I wouldn’t be surprised to see this go early. I’d take it as one of my first few picks. I could see it doing well in GW Landfall especially alongside other ramp sorcery spells like Sylvan Scrying. I’m not sure how I feel about this card. If you’re playing 3 colors or using green creatures that can give you any color, then 4 mana for 3 Ally creatures isn’t bad bad deal. However, it’s a little worse if you are only playing 2 colors. 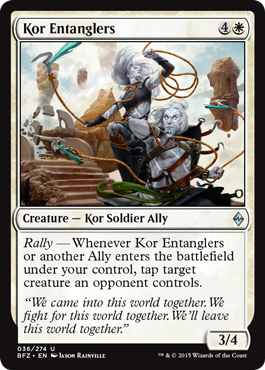 Since the tokens are Allies, that’s definitely a plus though and this would fit well in a 3-4 color Ally deck. The tokens would cause 2 triggers to happen, so if you’re playing the Entanglers you can tap 2 creatures, or in green there is a guy that gives all creatures +1/+1 when an Ally enters which means you’d get +2 or +3 power. Not bad in the right deck. The more colors you use, the better this card is. The last card I’d like to feature today is Tandem Tactics. This card is mostly an Ally deck card, especially if you have a card like Serene Steward in play. 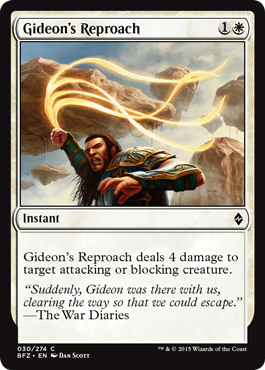 If Theros taught us anything, it was that combat tricks can be just as good as removal if you play them correctly. Tactics plays well both on offense or defense, and at 2 mana it’s aggressively costed. The 2 life you get is just icing on the cake. I think it will be a better draft card, but be sure to consider it in your sealed pool if you have cards like Felidar Sovereign or Serene Steward in your pool. Expedition Envoy – nothing special about this other than its Ally typing and speed. 2/1 for 1 mana can sneak in some damage before an opponent even plays something. Good if you’ve playing an aggressive deck. Ghostly Sentinel – 3/3 flyer for 5, has Vigilance so it can block . . . not bad but not amazing. Playable but I wouldn’t be afraid to cut it if I had to. Kitesail Scout – never hurts to have a first turn flyer! Great evasion early on can add up to a lot of points, especially if their flyers aren’t coming out until turn 4 or 5. Shadow Glider – a white Wind Drake. Roleplayer with evasion. Good card to have in your deck and fits well on your curve, but it won’t be an all-star. Compared to the other articles I’ve been doing lately, PTYW is much easier to do. I love looking through the cards and evaluating them or finding their synergies. The set is looking great for Limited, and I can’t wait until the pre-release this weekend. If you see any combos or synergies that I missed with the cards I mentioned so far, feel free to leave some comments down below. I’ll be working on Blue tomorrow and should have it out by the end of Tuesday, and Black should be out on Wednesday hopefully. I might (for once) actually have all of the colors done before the weekend! We’ll see. Thanks for reading and check back soon.